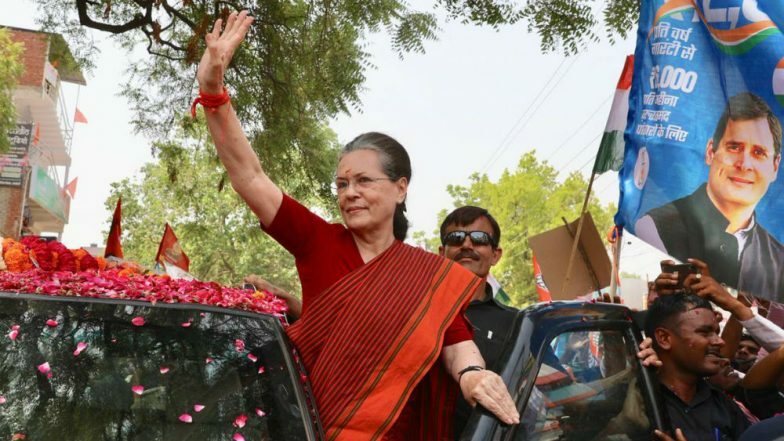 Lucknow, April 11: In the run up to Lok Sabha Election 2019, UPA chairperson and Congress leader Sonia Gandhi on Thursday filed her nomination papers for the Raebareli Lok Sabha seat in Uttar Pradesh. This year, the UPA chairperson is trying her luck to retain the Raebareli seat for the fifth time. Ahead of filing her nominations, Sonia Gandhi along with Rahul Gandhi and Priyanka Gandhi Vadra took part in a ‘hawan’ (pooja) at the Congress’ central office. She also undertook a 700-metre road show before filing the nomination on Thursday. Uttar Pradesh Lok Sabha Elections 2019 Schedule: Constituency Wise Dates Of Voting And Results For UP General Elections. Polling for the Raebareli seat will head for voting in the fifth-phase on May 6. There is going to be a straight contest between Sonia Gandhi and Dinesh Pratap Singh, who had recently joined the BJP after quitting the Congress party . Reports inform that the Samajwadi Party and the Bahujan Samaj Party have not fielded any candidate in from this seat. It must be noted that Sonia Gandhi had won the seat in 2004, 2006 (bypolls), 2009 and 2014. On Wednesday, Congress President Rahul Gandhi had filed his nomination for the Amethi Lok Sabha seat. Rahul Gandhi has represented Amethi since 2004. Before him, Amethi was represented by Sonia Gandhi. Besides Amethi, Rahul Gandhi is also contesting from Kerala's Wayanad parliamentary constituency. Polling in 91 constituencies spread across 18 states and two union territories in the first phase of Lok Sabha elections began on Thursday. Voting is also underway in 175 assembly seats in Andhra Pradesh, 32 in Sikkim and 28 seats in Odisha.